The colorful bison has hidden designs, perfect to keep a child interested while you get ready to browse! This neat buffalo is just inside the door at the C.M. Russell Museum! It’s not just “western art,” but a museum that lives up to its name as the “art and soul of the American West.” Your kids will LOVE it! 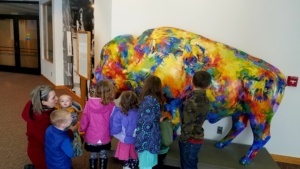 Want to see more Kid-friendly museums? CLICK HERE! PREVIOUS POST Previous post: Affordable Fun!